An Interview with Sarah Tahern. · One Book. One Author. One Hour. 1:24 - What was your official title at C-SPAN and when were you involved in Booknotes? – Started at C-SPAN in 1987 as a guest coordinator, moved up to call-in coordinator, and eventually became a producer ,then a senior producer. Trahern was at C-SPAN 1987-1995 and was involved with Booknotes 1989-1995. 1:57 - How were authors chosen for Booknotes? – They would receive 20 books for every book chosen. Producers read reviews and excerpts from books to choose what Brian Lamb would ultimately read and do an interview on. Trahern considered this to be a lot of pressure because Lamb’s time was so valuable and he spent so much of that time on each book in preparation for his interviews. Lamb sometimes brought other books to their attention. 4:14 - How did selected authors react to your call asking them for the interview? – The C-SPAN staff would deal with authors themselves or with publishing houses. Authors were always excited to appear on the program, as most were familiar with C-SPAN. Trahern had forgotten the program covered a book a week and was impressed with the time and attention Lamb gave each work. 5:48 - Were there any authors who wanted to be interviewed but were not chosen? Did anyone refuse the invitation to be interviewed? If so, why? – As she recalls, no authors refused the invitation to be interviewed. Some authors were not prepared for Lamb’s in-depth interview style. With the Booknotes interview you got a unique, in-depth understanding for the author, their book, and their subject. 8:32 – A Booknotes interview is quite simple in appearance – a black background and two people. Was there a reason for such a simple set? – The focus was on the content and the content was king with this simple set. The set was a way to ensure the guest and their content was strong enough to hold the audiences’ attention. Lamb never spoke with authors about the books before the interview so they could meet and ask the introductory questions for the first time on-set. The interviews were only minimally edited. One of her favorite memories while working on the program was meeting with Richard Nixon before his Booknotes interview, putting powder on him to make him camera ready, and discussing baseball. She also recalls being awe-struck when meeting Caroline Kennedy and being impressed with the work of David McCullough. 13:28 – Were there ever any Booknotes bloopers or unplanned happenings during the tapings of the program? – Because Lamb asked open-ended questions sometimes authors didn’t know what to expect. Authors were sometimes asked about who people were and what items were which were so simple the author wasn’t sure how to answer. By asking the basic questions Lamb was hoping to bring in new audiences. 14: 45 - What did the producer do after the interview in order to prepare the interview to air? Was there a rule for when they were scheduled to air? – Sometimes editing would be as simple as adding in introductions and exits for a program or adding in photographs featured in the book. Several interviews were usually shot at one time and then their airdates were spread out to diversify content and to allow for last minute additions of new, newsworthy content. 16:30 – Not every Booknotes interview was conducted at the C-SPAN studio in Washington. Where else were interviews conducted, and what were those logistics like? – The majority of interviews were done within the studio in D.C. Booknotes inspired other C-SPAN shows that traveled more. For those Booknotes interviews that did travel, Trahern was always impressed with how mobile the C-SPAN team was. 18:23 - What did you learn about authors and the book world while producing Booknotes? – Through her work with the show, Trahern is amazed with the authors who produce multiple books because they put so much time and effort into each topic. Trahern would like to go back and re-read some of these books. She has great respect for the work done by authors and felt that authors had a great respect for Lamb and the attention the Booknotes team put into their work. This show was a major influence for other C-SPAN programs, especially Douglas Brinkley’s Majic Bus which spawned the C-SPAN bus. 22:08 – In your estimation, what has been the lasting impact of Booknotes in the then-contemporary American society and, perhaps, in subsequent times. – Trahern has been gone from C-SPAN for 20 years but she still includes her work with the network and Booknotes on her biography because of how much it impacted people. Booknotes has a role in history by providing context to the authors and their subjects. 24:25 – Is here anything that you would like to add regarding the Booknotes program, C-SPAN or Brian Lamb? – Trahern thinks Lamb is a visionary in the media landscape who does not get enough credit. C-SPAN has had an impact on so many different areas of American life. 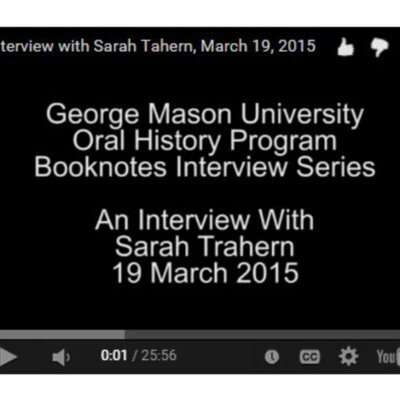 Lindsey Bestebreurtje (Oral Historian) , “An Interview with Sarah Tahern.,” One Book. One Author. One Hour., accessed April 21, 2019, http://booknotes.gmu.edu/items/show/2809. Booknotes Oral History Series. R0143 Box 02 File 15.